HuffPost has comprehensive coverage of the Tax Day Tea Party protests. Click here for the latest photos and video. Brian Sperry, a spokesman for the U.S. Postal Service, told the Salt Lake (Utah) Tribune that tea bags in the mail "cause us some concern. ... They could pose a problem if the tea bag is mailed in a regular envelope instead of a padded bag." In Boulder, Colo., the district office of U.S. Rep. Jared Polis recently called for help after a lumpy white envelope with no return address arrived in the mail. The Boulder County Hazardous Materials Response Team found a tea bag and a note reading "We the People, 1773." Earlier this month in Manchester, N.H., a hazmat team descended on the office of U.S. Rep. Carol Shea-Porter after employees opened an envelope marked "tax protest" and found a bunch of tea leaves. And two days later, the office of Rep. George Radanovich in Modesto, Calif., was evacuated "after an intern in the mailroom came upon a suspicious package that was later found to contain tea." A haz-mat team and the FBI were were called in. About 20 people from the building, including those in the congressman's office and two mortgage firms, were evacuated as a precaution. Modesto Fire Battalion Chief Rich Sasser said the envelope held a granular substance. It did not have a return address. 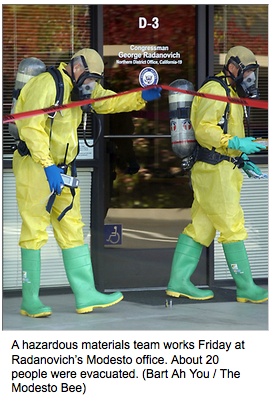 About 3 p.m., the Stanislaus County Hazardous Materials Response Team went into the office. Sasser said their monitors showed there was nothing dangerous, so the hazmat team double-bagged the sealed envelope and turned it over to the FBI. "We can't control who mails what to wherever," Sgt. Kimberly Schneider, a Capitol Police spokeswoman, told the Salt Lake Tribune. "At all times, [United States Capitol Police] will investigate and take the appropriate police action in response to any calls to us for any suspicious items that congressional staff might be concerned about."